Kkakdugi is a type of kimchi which has all the ingredients of the popular staple, but instead of using Chinese cabbages, it’s substituted with daikon radishes. Radishes are cut into small cubes and flavored with salt, red chili pepper powder (gochugaru), spring onions, and ginger. After mixing all ingredients, it is traditionally stored away in a cool/dry place for approximately two weeks for fermentation. There are many different variety of this side dish that are enjoyed by Koreans at home or which can be found at popular restaurants. Other variations exist using different types of daikon and/or distinctive ingredients such as tiny salted shrimp, water dropwort leaves, raw oysters, and assortment of spices. Kkakdugi is served cold and usually consumed when the fermented radish is crisp as opposed to being soft. Kkakdugi along with other types of kimchi is a popular staple/side dish and most popular while eating sollontang, galbitang, or samgyetang. 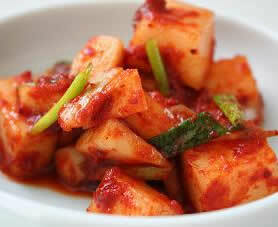 Additionally, it is known to share many of the health benefits of kimchi which can also aid in digestion of food. Wash and trim radish, then peel the skin and cut it into ½-¾ inch square cubes. Add 1 tbsp sea salt and 1 tbsp sugar to the diced radish, marinate it for 1 hour. Trim and wash watercress and scallions, cut them into 1-1½ inch long pieces. Add gochugaru to the marinated radish and mix thoroughly. Add and evenly mix in garlic, ginger, salted shrimps, and 3 tbsp sea salt. Add and gently mix in watercress and scallion. Store them in your container of choice and press/compact down before closing lid. Let fermentation occur for about 3-5 days before eating for optimal taste. Fermentation will occur quicker if left unrefrigerated.